at oddest times there's music streaming through this head of mine, and then some. you don't wanna know. anyway, 't 's been a full moon, that i've tried to capture on the digital, but a mean lens just won't do. onwards and forwards. now i did come across this cute setting. the wooden serving tray i'd seen a few times already, it just moved from spot to spot in the thrift store. until now, that is, them geese (if that's what they are) cranes are flying in this our house now! the tiny vintage crochet circly bits will go into a project. the toile de jouilly lamp shade? well, we all know where lamp shades go. hey-dee-ho and sophie's open for the day. 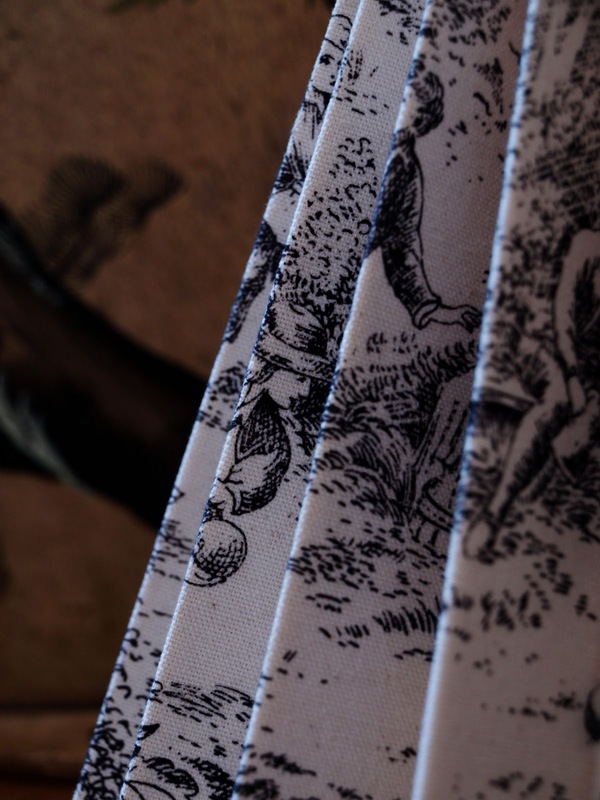 i love toile de jouy fabric! i'd love to see the shadows it makes. Loving your presentation of these cool finds! no need to explain i know all about the music in the head bizzo LOL!! gotta say i've got some serious tray envy going on..and as for the toile joli..well, what can i say? ?..DIVINE finds! Love those cranes! As well as all the rest, such fantastic finds, and photographed so beautifully too, love your style! Great finds Wolfy, sorry it's been so long since I've stopped by to say hello, not much time these day's. I love that tray with the cranes and who doesn't like a pretty lampshade. 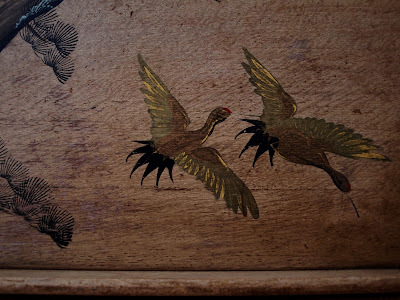 Beautiful finds, I love the birds! p.s. thanks for stopping by- your comments always get a laugh! the crochet circles are beautiful! Thanks for stopping by!! Beautiful crochets and lamp shade! Love it. Thanks for visiting me! I agree with everyone else, great photography. I can't wait to see your house once all the renovations are done with all of your lovely bits and bobs. I will join you this week drawing...it is something that doesn't come easily, which is the reason I want to do it. I missed the super moon. Perhaps tonight I'll see a not-so-super moon! the moon is filling my head up with loud music! great finds! that lamp shade looks lovely! Your Header or your Banner, Kers, is having a hot flash, I fear! great finds. i love the composition in your first shot! tres bon!